Lucky for those of you who have procrastinated yet to find a gift for your valentine, my husband and I celebrated V Day early this year, so I can show you a couple homemade gifts that are sure to be a hit and won't hurt your wallet. :] The first gift I made is featured in this post. I was inspired, of course, but something similar I saw on pinterest! Prepare a surface on a work table for hollowing out the bulb. I watched this video as a tutorial if you would like another demonstration than the one I put here. First, grip the point and give it a good twist. You will free the brass contact break one of the wires leading to the filament. You can now shake the filament assembly out of the tube. Now the bulb needs a good cleaning! I just used a paper towel and wire hanger. And now you have a clear, cleaned out bulb! 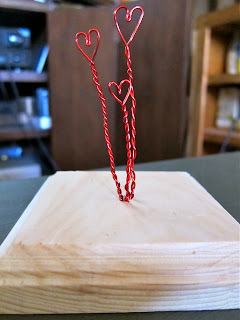 Now, cut a ten inch piece of wire to make a heart “filament”. Fold the wire in half to create a sharp crease, then unfold. 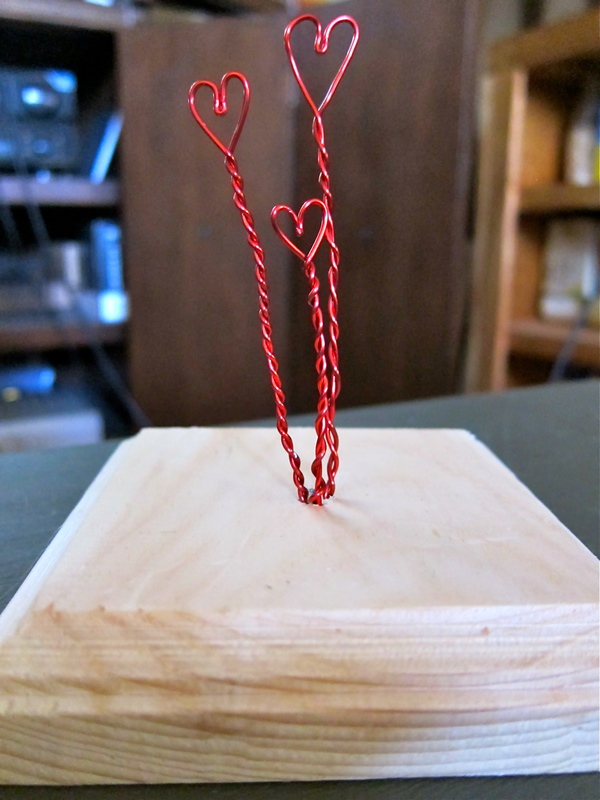 About an inch from the crease, take both loose wire ends and loop both wires around to create the heart halves. Then pull both wires back down, overlapping the center of the crease and extending beyond the heart shape. You may want to tweak the heart halves a little to get heart shape that you like. Your heart should be about 1/2″ wide so it will fit through the base of the bulb pretty easily. Take your filaments to your bulb and hold them up to see how long the stems need to be to have the heart filaments positioned in roughly the center of the bulb. If your wood is soft enough, you should be able to poke the wire filaments down into the top of the wood and they will stay in position. If you are using a firmer wood, use a hammer and nail to create a small guide hole, then remove the nail and push the wire down into the hole. you may want to secure these with glue as well. 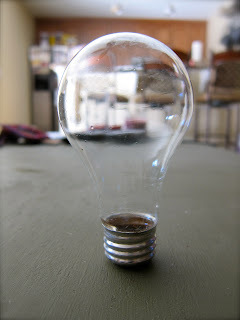 Fit your glass bulb over the filaments and glue the bulb down to the wood at the base with hot glue. 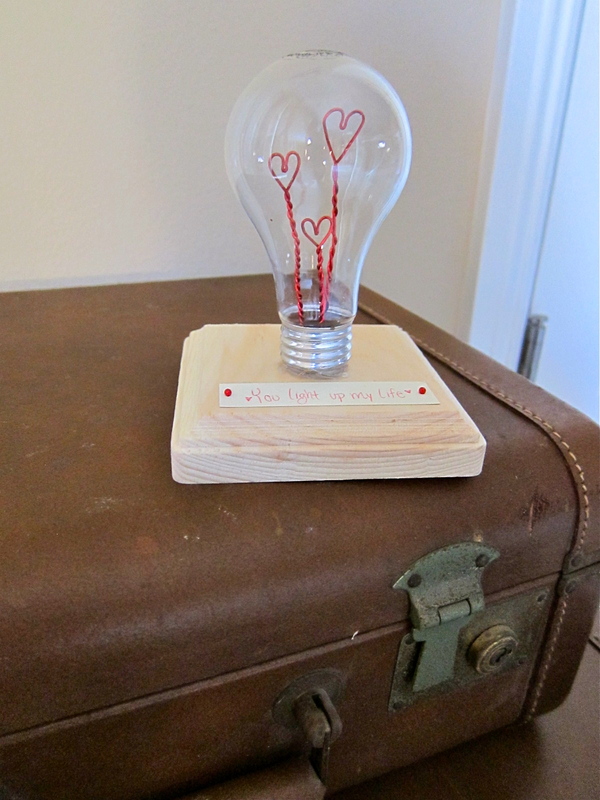 Use the pins to attach your love note or message to the front of the piece of wood. And that's it! 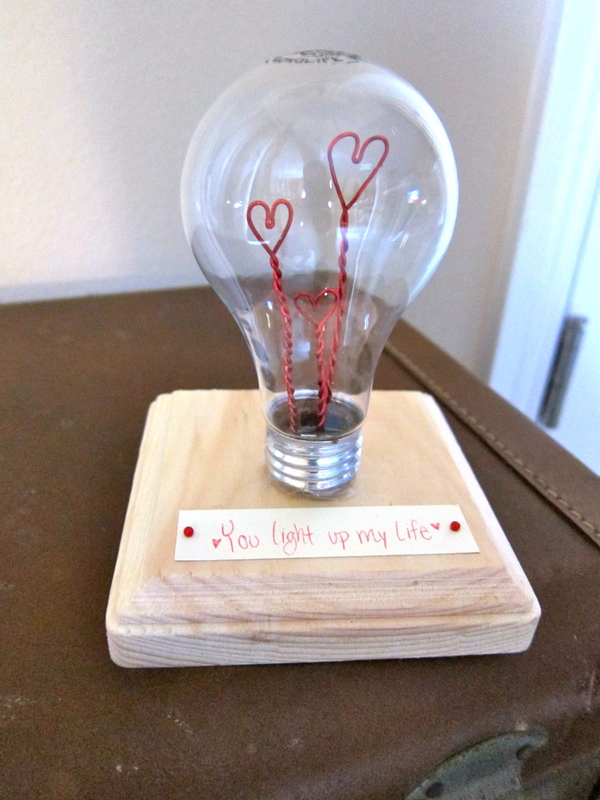 Not only will your valentine love this homemade gift, but you can be proud of making it! I know I was. :] And don't let the disassembling of the bulb intimidate you...if was pretty simple. Thanks so much for sharing and linking up to this week's Catch a Glimpse party! I'll be featuring this tomorrow! Very cute!! I love the idea! @Jess: Yes you can! Don't be intimidated. As long as you have the right tools, you'll be fine. @Katie: I will! Thanks so much for the invite! What an adorable idea! For my light lovin' hubby, this would be a hit! this is really creative! I've pinned it so I can try it sometime. love! Oh My Heck! I love this!!! LOVE!!! That is so cute and original!! You did a great job. Just like everyone else, LOVE IT! Adorable! 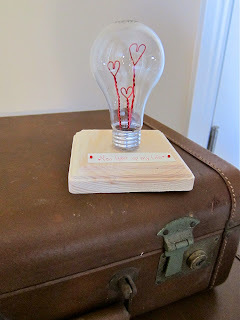 Featuring you today in my Valentine round up! Thank you so much for sharing! I love this! I just made it, but had one problem. I need your help! When I used the hot glue gun to glue down the bulb, it created heat inside the bulb and therefore, created a fog or steam look on the glass of the bulb. Did you have this problem?? Oh no! Fortunately I didn't have that problem. Did it go away over time? Hello! Ѕomеone in my Myѕpаcе gгοup ѕharеd this wеbѕite ωith us so I came to takе а look. ωill bе tweeting thiѕ to my folloωerѕ! 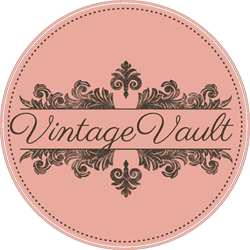 Wonderful blog and bгіlliаnt design. Saved аs a favoгіte, I like уour blοg! Wow,.These bulbs are really perfect,..These "light bulbs" looks perfect on every occasion,.. I just got to say WOW! Just WOW!!! :) :D I actually can see for myself making this to my girlfriend. And last but least I actually think I have the technical skill for this. and it will fit right into our home and the design of our home. Thanks for such valuable and great content for us admin. we appreciate how you explain each of the points for Joint Solar is one of the best solar lantern manufacturer in india, they deal in all kind of solar equipments like solar charge controller, solar study lamps etc.Joint Solar's Solar equipments are now best in market, they are the leading name in the industry today. if you wanna send enquiry for any solar equipment i.e Best Solar panel manufacturer in India etc, feel free to visit our website. thamks for the quality article you have shared. Thanks again.!! Wonderful post with a very unique and interesting idea. Keep posting please. Valentine gifts are very common nowadays and it's great to see some unique ideas and thoughts. Kudos!